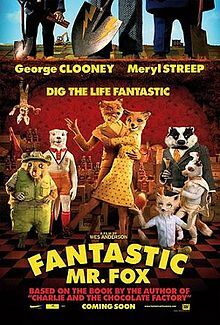 Based on a 1970 novel by famed children's book author Roald Dahl, "Fantastic Mr. Fox" (2009) is much more Wes Anderson and Noah Baumbach than it is Dahl. This film will appeal to adults as well as the children at which it is aimed. Characters smoke, "cuss," and do all the things that real people do that generally don't turn up in children's animation. 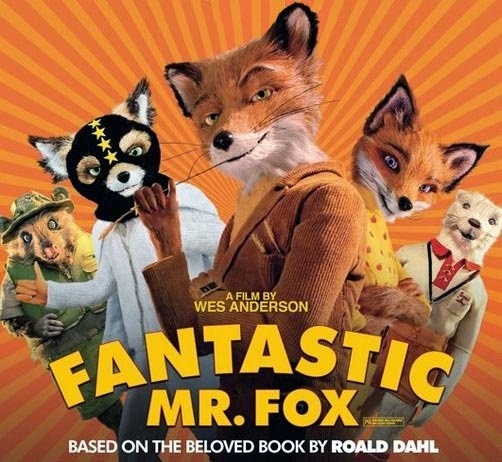 If you are familiar with Anderson's work, you know to expect a lot of dry comedy and weird juxtapositions, and that is exactly what you get in "Fantastic Mr. Fox." 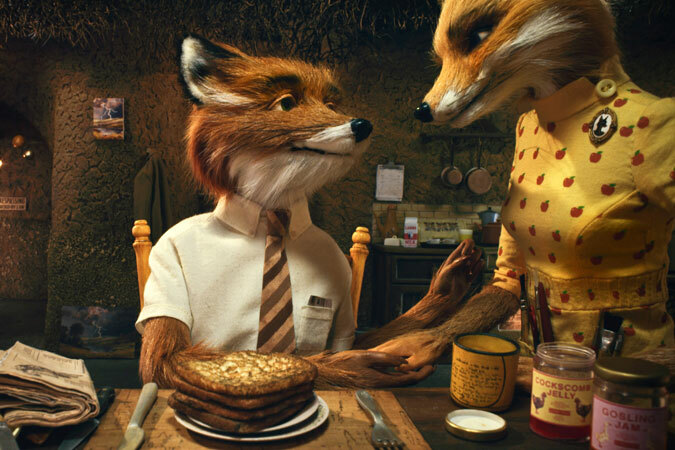 Mr. Fox (George Clooney) and his wife Felicity (Meryl Streep) like to raid farms in their spare time, but Fox's real job is as a newspaper columnist. After having a son, he decides to upgrade his family's living quarters from a hole in the ground to a tree despite warnings from his lawyer Badger (Bill Murray) that he is inviting danger. 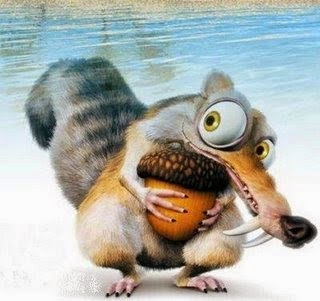 He also gives up his thieving ways for the sake of family stability. Fox's nephew Kristofferson (Eric Chase Anderson) comes to live with them, but Fox's son Ash (Jason Schwartzman) doesn't like Kristofferson because everyone dotes on him due to his excellence at sports. 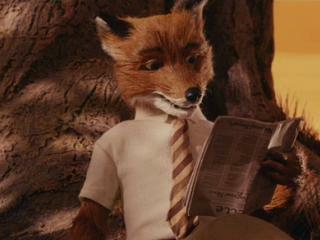 Fox eventually tires of dull "lawful" life, so he and his friend Kylie (Wallace Wolodarsky) take to stealing from the three farmers who live nearby: Walter Boggis (Robin Hurlstone); Nathan Bunce (Hugo Guiness); and Franklin Bean (Michael Gambon), or "Boggis, Bunce and Bean" as Fox calls them. The farmers set a trap for Fox and shoot at him, but he manages to escape at the cost of his tail. Frustrated, the farmers dig into Fox's home, but he escapes through an emergency tunnel. Fox decides to strike back. He enlists his friends to dig a tunnel to the farms so they can steal from them easier. 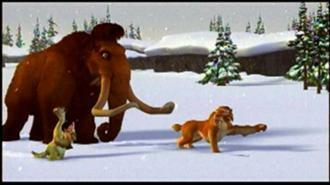 Ash and Kristofferson surface to recover Fox's tail, but Kristofferson is captured. The fighting escalates. The farmers flood the animals' tunnels with cider, forcing Fox and friends into the sewers. Fox finds out where Kristofferson is being held and asks the farmer for a meeting.They agree to an exchange, but everybody double-crosses each other and Ash must prove he has matured in order to free Kristofferson. 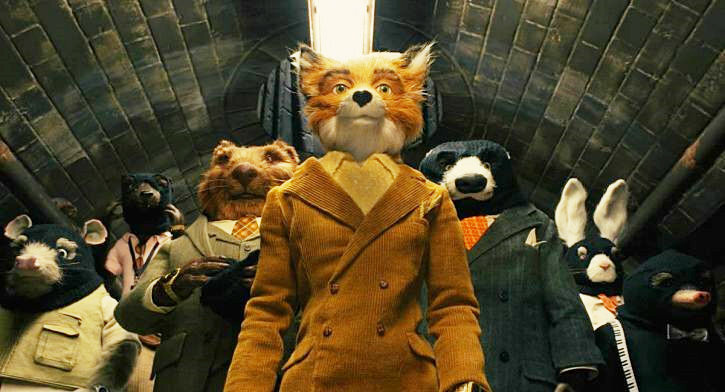 The interplay between the animals is witty and fun, and the stop-motion animation - 20th Century Fox's first - is superb. The colors are autumnal, all yellows, oranges and browns, giving the film a very soft feel. They are earth tones, in accordance with the fact that our heroes live... in the earth. Three venerable tunes by Burl Ives were used. This is an obvious and much-appreciated nod to the seasonal stop-motion classic holiday special from Rankin/Bass, "Rudolph The Red-Nosed Reindeer," in which Burl Ives voiced the narrator, Sam the Snowman. There is some action, including a fight to the death, which might scare some younger viewers. The film strains somewhat to imbue Fox with a James Bond vibe (Doahl, incidentally, wrote the screenplay for the James Bond classic "You Only Live Twice"), but that is kind of a genial lampooning of the characters. Overall, this is a fairly, um, tame film about gentle animals who act tough but are actually pussycats at heart. The voice actors are all top-notch. 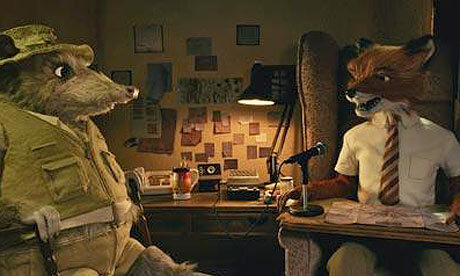 Rather than have them record their lines in a studio, Anderson took them on location and had them approximate the situation of their characters in the film when the dialogue was spoken. Thus, some was spoken underground, other dialogue in closets, etc. I am absolutely certain that this amused Bill Murray to no end. 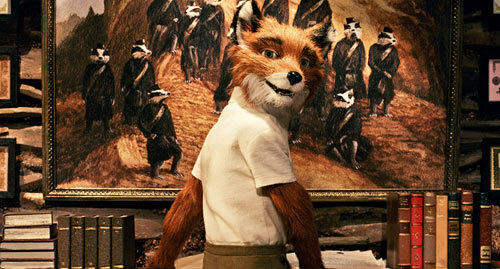 It all gives the film a fresh, authentic feel that often is lacking in the cookie-cutter animation of other studios. 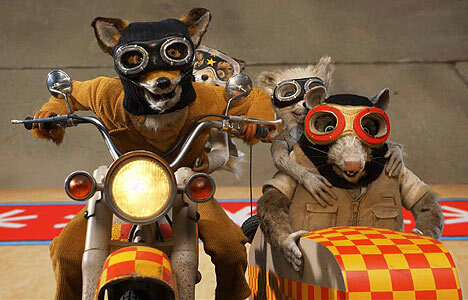 "Odd" is a word often used to describe Anderson films like "Fantastic Mr. Fox," but that is not necessarily bad. If you are tired of the current Pixar/DreamWorks/Amblin style of slick animation, which is polished to perfection and a bit too all-that at times, this film will serve as a great antidote. 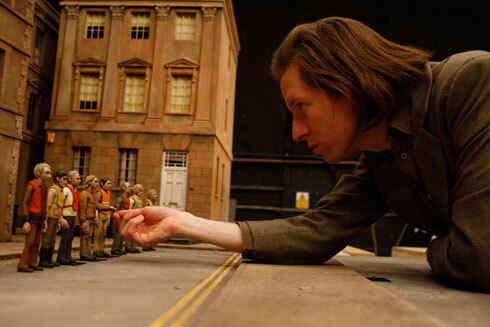 Wes Anderson and Roald Dahl make a great team. You should pick up a copy of "Fantastic Mr. Fox." Below is the official trailer. 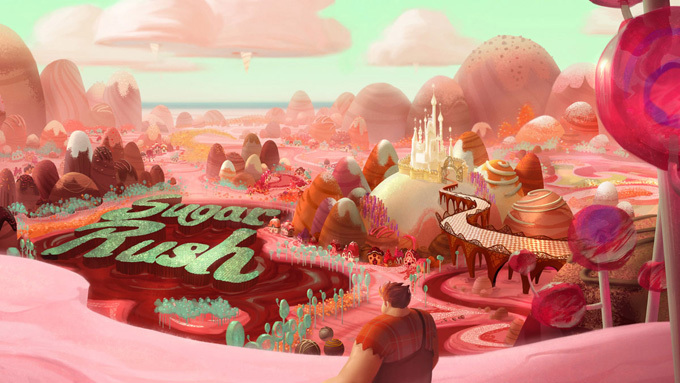 Directed by Rich Moore, "Wreck-It Ralph" (2012) combines the two fads in entertainment: animation and video games. Walt Disney Animation Studios can put these films out in its sleep, and this is the 52nd entry in its animated feature series, which began way back in 1937 with "Snow White and the Seven Dwarfs." 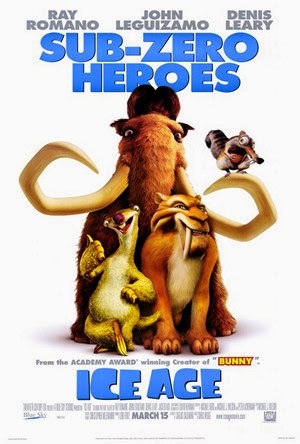 If Disney, especially with the help of head guru John Lassetter, doesn't know how to make a quality animation film by now, it is in deep trouble - but this is a fine film, whether from Disney or anyone else. As a bonus, it is in glorious 3D (though you can see it in 2D as well), which really works in the arcade-game setting. Litwak's arcade is a normal place during the day, but at night it gets even more exciting. That is when the video game characters are free to escape their confines within their respective games and visit other games. 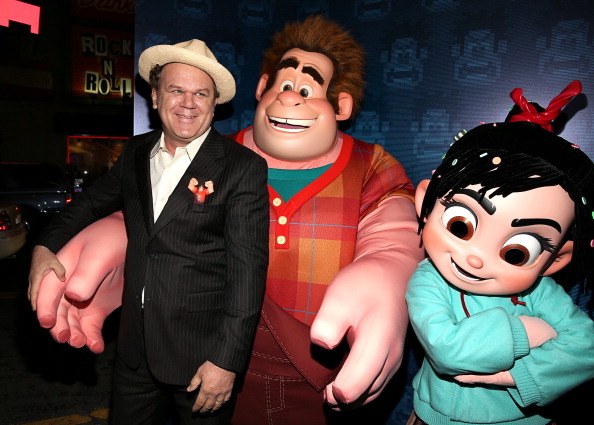 One particular character in the game "Fix-It Felix, Jr." is Wreck-It Ralph (John C. Reilly). Ralph wants to do more than just visit another game: he wants to leave behind his own game character, which forces him to be the villain, behind and become a hero instead. Calhoun, star shooter of "Hero's Day"
Ralph's first step to accomplish this goal is to visit "Hero's Duty," which is a military first-person shooter pretty obviously modeled after "Call of Duty." In it, the game's winner receives a medal. Rather than win the proper way on merit, though, Ralph can't help himself from being bad. He surreptitiously steals the medal and theeby hatches a Cy-Bug, which clings to him as he tries to escape. 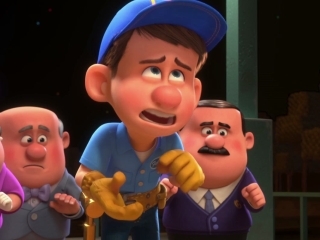 Meanwhile, Felix (Jack McBrayer), the hero of Ralph's own game, needs to find him before Mr. Litwak shuts their game down as malfunctioning, so he starts searching. 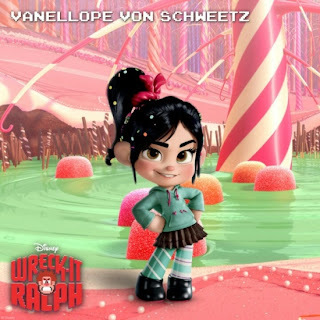 Ralph winds up in another game, "Sugar Rush," where he meets Vanellope von Schweetz (Sarah Silverman), who quickly steals his medal. Felix, meanwhile, learns from Calhoun, the hero in "Hero's Duty" (Jane Lynch), that Cy-Bugs will destroy any game that they enter. That makes it essential that they find Ralph before he destroys the entire arcade in his wanderings. Ralph eventually learns the danger he has placed everyone in and finds Felix and Vanellope. Together, they battle a swarm of Cy-Bugs that have hatched. 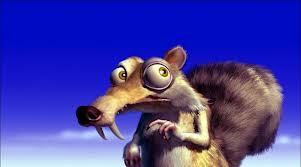 Ralph has to come up with a plan to attract all the bugs that he has unleashed to one place so that they can killed before they take over all the games. 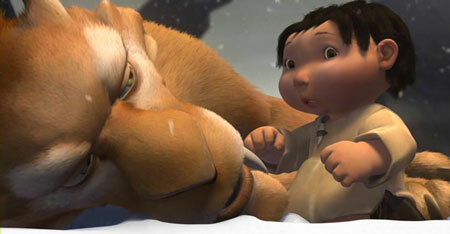 The plot is fairly complicated for a Disney film, but it is easy to follow as the movie proceeds. The special effects are top-notch, and there is a lot of humor floating around (as you would expect in anything featuring Sarah Silverman). 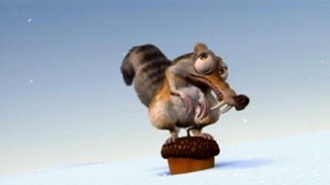 There is an unusual amount of character development for an animated film aimed at kids, and it all serves a good purpose in showing how nothing is beyond our control to improve ourselves. The people who will most appreciate this film, though, are fans of old video games. 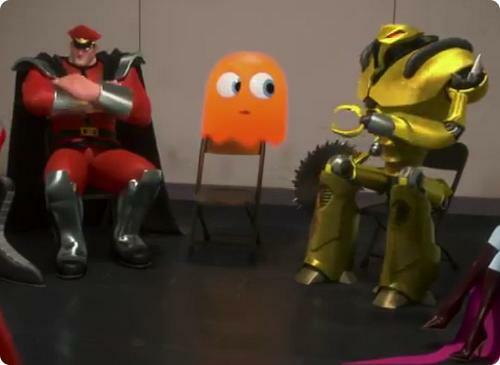 There are cameo appearances by characters from a number of classic video games: Bowser from the "Mario" games; Doctor Eggman from "Sonic the Hedgehog; Pac-Man and several other characters from "Pac-Man"; Q'bert; and many others. Oblique references are made to other games, such as "Final Fantasy." You can have fun with this film just by looking for all the references to games you may have forgotten or only played a few times back in the day, or (admit it) obsessively raced home from school to fire up and start playing. The voice actors are all top-notch, with John C. Reilly showing that he at least is capable of being a leading man in the video game universe. He has a naturally world-weary inflection that perfectly suits a bored video game character. Sarah Silverman is at her annoying best, and her fans will know what that means. 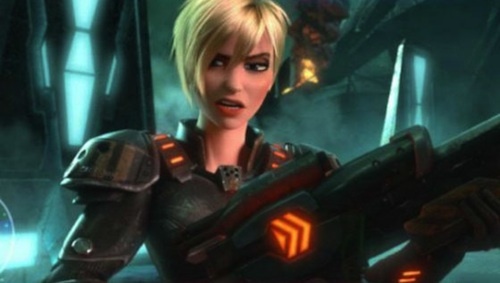 Jane Lynch is gruff but amusing in her own over-the-top way as the star of her own action game. The characters were all likeable, with neuroses and sensitivity completely at odds with their video game personas. There is a Rihanna song thrown in for those who are fans. Sarah Silverman obviously is a little out of place playing a little girl, but she pulls it off nicely. Jack McBrayer all but steals the picture as bashful Felix. The real draw, though, is the animation, which is stellar. Each game has its own visual style which matches its theme: the shooter game is realistic, the racing game is very colorful, and so on. Watching this is almost like opening a textbook and examining how color and theme combine to create the atmosphere of a given game. It's fun for those who remember the old Nintendo and arcade video games from the dawn of the computer age to see how well the animators created new takes on very old themes. The energetic score by Henry Jackman is perfect for a film about fast-paced video games and mixes electronic and traditional instruments seamlessly. Just like in a video game, the music complements the action and helps keep the viewer focused. As of February 2013, "Wreck-It Ralph" has grossed over $400 million, making it Disney's biggest success at least since "Lilo & Stich." 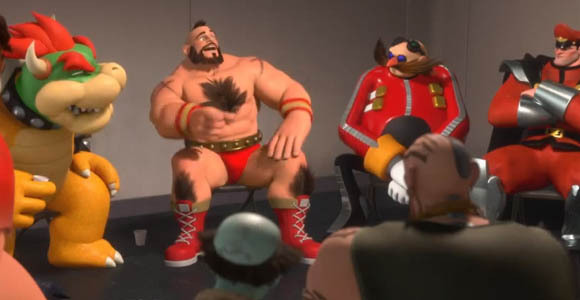 Of course, 'Wreck-It Ralph" still falls short of the grosses from the truly massive franchises such as "Shrek" and "Toy Story," or even ones like "Madagascar 3: Europe's Most Wanted," but you have to be realistic about what is possible. 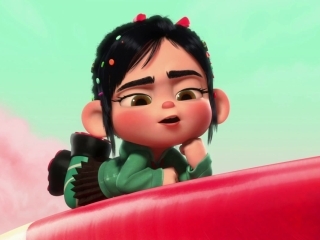 Certainly, Disney has to be happy with the performance of "Wreck-It Ralph." It was a long, hard decade for Disney, brightened only by the 2006 merger with Pixar and Pixar's own continued success. 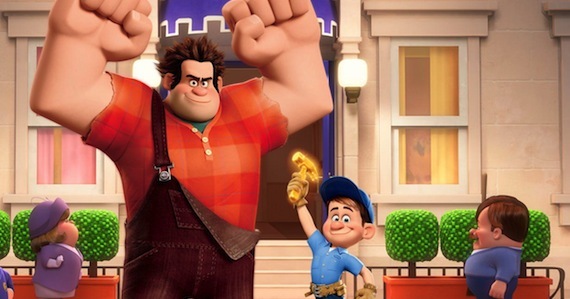 Many make the argument that "Wreck-It Ralph," in fact, is more of a Pixar film than a Disney movie, and it is difficult to argue with that. 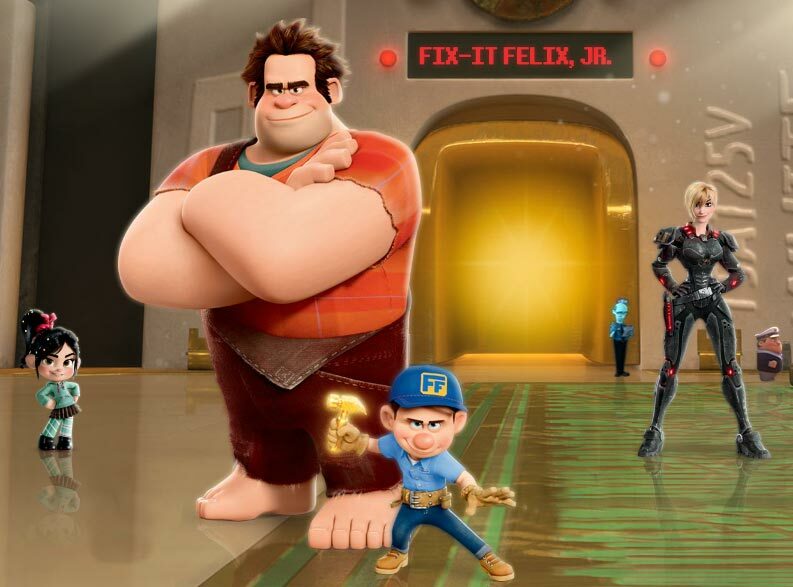 The Flashy graphics, lack of "moral lessons to be learned" and the focus on simply entertaining rather than trying to create some kind of classic rendition of a well-known fairy tale all mark "Wreck-It Ralph" as having the Pixar imprint. 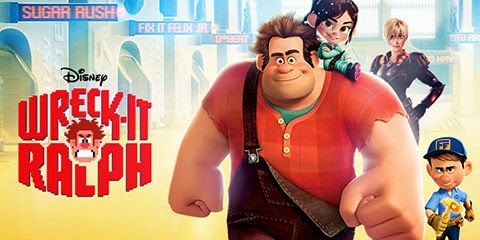 Be that as it may, "Wreck-It Ralph" bears the Disney imprint and is the 52nd feature film in the Disney Animated Classics series. 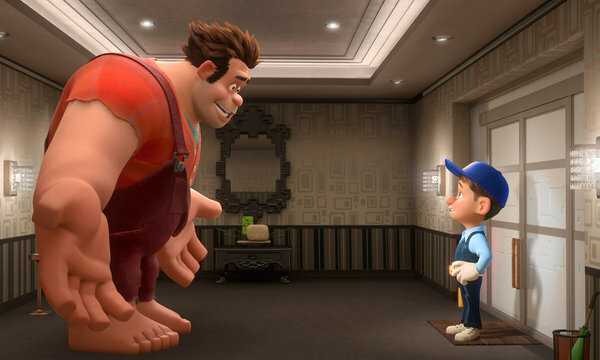 If there is one caution, it is that the humor in "Wreck-It Ralph" occasionally descends into crudeness. While it won't do more than perhaps annoy (or more likely amuse) adults, the raw jokes might be a little much for some parents concerned about what their children hear. Regardless, the gags are very funny if taken in the right spirit. 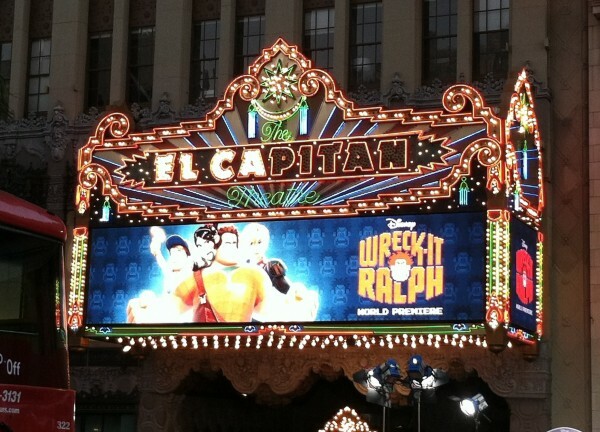 Marquee at the El Capitan for "Wreck-It Ralph"
"Wreck-It Ralph" is one of Disney's better recent offerings and a worthy addition to their library. It isn't as deep some of their older films, and has an air of superficiality throughout, but it should keep you entertained. 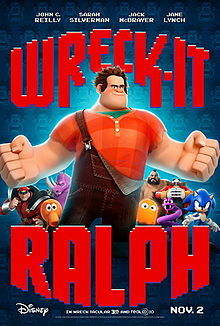 Below is the official trailer for "Wreck-It Ralph." 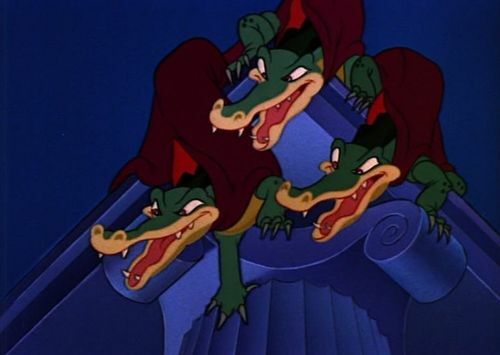 Fantasia (1940), directed by a team of uncredited Disney pros, has a fascinating story behind it. Walt Disney was unhappy. Mickey Mouse, the jewel in his crown, the oyster in his salad, was losing favor with the public. Mickey had been the undisputed king of short films since his introduction in 1928 and had his own comic strip in the papers, but times were changing. Without Mickey, the studio would become directionless, dependent as never before on animated beloved fairy tales of which there was a limited supply. 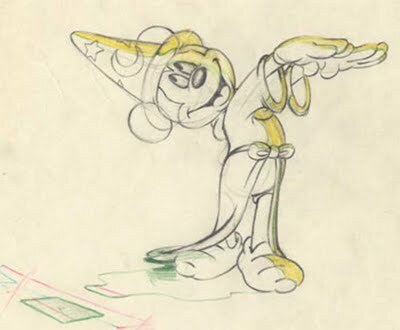 A draft of Mickey Mouse in "The Sorceror's Apprentice"
Somebody suggested using Dopey, one of the dwarfs from "Snow White and the Seven Dwarfs, in a "Silly Symphony" short, and something clicked in Walt's head. He would instead use Mickey and make it the Silly Symphony to end all Silly Symphonies! However, after thinking about the short, which he had decided would be entitled "The Sorcerer's Apprentice," Walt was still unhappy. The quality indeed was better than anything Mickey had been in to date, with brilliant, vibrant colors and a wonderful soundtractk. Another, bigger problem had arisen: he needed to make some money off of it, and the little project had ballooned in cost. His plan to resurrect Mickey had put the financial health of the studio in jeopardy, and little did he know the financial disaster that awaited in "Pinocchio." The solution was to double down on Mickey. 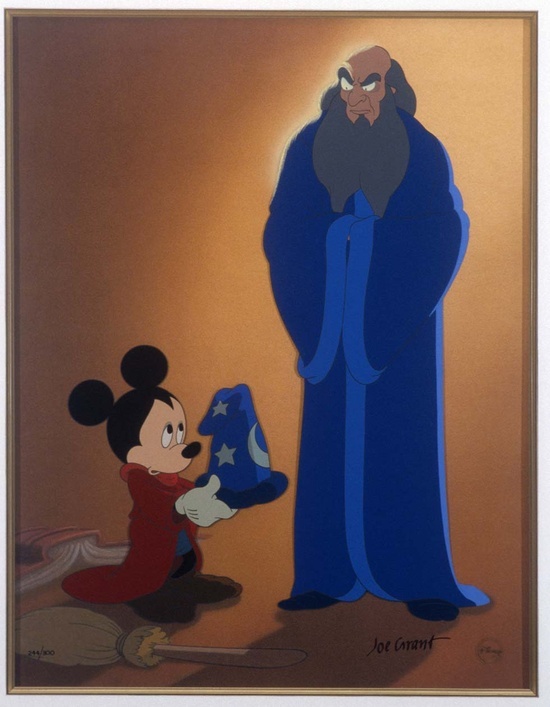 Rather than create just another short, Walt decided to expand "The Sorcerer's Apprentice" into a feature-length film. All he needed was a conductor. He ran into Leopold Stokowsi, head of the Philadelphia Orchestra and famous in his own right, and, over dinner, Stokowski agreed to conduct for nothing. With Stokowski on board, Disney's imagination ran wild. He would create an entire animated concert! Without a story or any structure, though, he would need somebody to tell the audience what was goingon. He brought Stokowski in and they settled on Deems Taylor, the popular host of weekly radio broadcasts of the New York Philharmonic, as the master of ceremonies. Toccata and Fugue in D Minor by Johann Sebastian Bach. Nutcracker Suite by Pyotr Ilyich Tchaikovsky. The Sorcerer's Apprentice by Paul Dukas. Rite of Spring by Igor Stravinsky. The Pastoral Symphony by Ludwig van Beethoven. Dance of the Hours by Amilcare Ponchielli. Night on Bald Mountain by Modest Mussorgsky and Ave Maria by Franz Schubert. There also was a jazz jam session after the Intermission, which fell after "Rite of Spring." 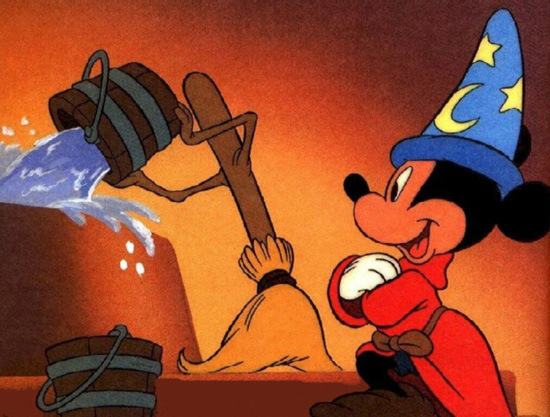 Mickey having fun in "The Sorceror's Apprentice"
The animators went to work. For inspiration, they studied famous ballerinas and brought in animal experts such as the Director of the Museum of Natural History, Roy Chapman Andrews. Over one thousand artists and technicians became involved, and color stylists carefully created color schemes that would flow from piece to piece. Different directors were used for each sequence, with Ben Sharpsteen helping to both produce and direct. 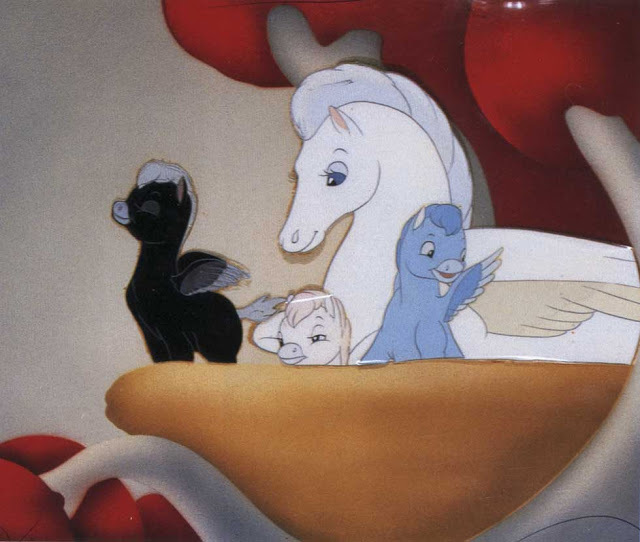 A Pegasus and its family in "The Pastoral Symphony"
Walt Disney still wasn't done. He wanted to do something big, to stretch the boundaries of animation. Stokowski and he dreamed of releasing scents in theaters for different musical numbers, but that proved unworkable. 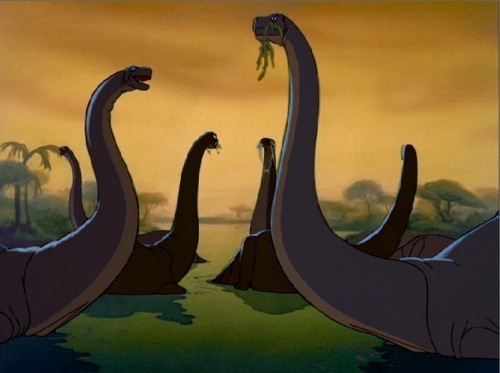 Since the music was so important in this project, more so than in any other animated film, Disney contacted David Sarnoff of RCA, who agreed to create a stereophonic surround sound system that had never been used in film before. The result was "Fantasound," which captured the symphony's sound better than ever before. The process was never used again, though it led to advances in multi-track recording, overdubbing and noise reduction. A Centaurette in "The Pastoral Symphony"
With everything in place, the picture was completed, but then a new problem arose: RKO refused to distribute it, calling it too long (Disney's only feature over two hours) and a "longhair musical." 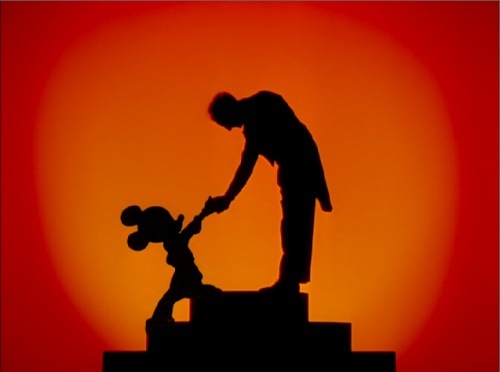 Walt said fine, I'll just take "Fantasia" on the road, and that's what he did. "Fantasia" opened in a total of thirteen roadshows held in major cities across the country. They were elaborate affairs, with special illustrated program booklets and special theater marquees for "Fantasia." 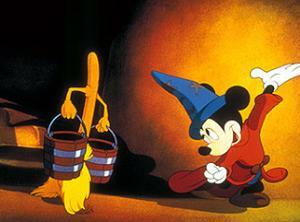 Upon release, "Fantasia" immediately broke box office records, but the limited release meant limited revenue. It was sort of a game back then, "10 Smash Weeks at the Roxy" and all that were so much hooey, so you have to take such "records" with a grain of salt." The onset of World War II eliminated European revenues, and RKO took over distribution. 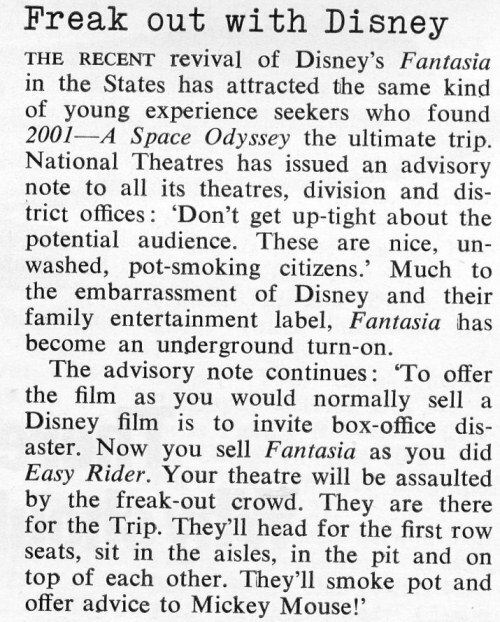 To cut costs, RKO eliminated Fantasound, which was expensive to set up in each theater, and cut "Fantasia" drastically to allow more showings. "Fantasia" was reduced to second billing to a low-profile Western and lost money. Several scenes are quite scary, this is from "Dance of the Hours"
Disney Studios stayed in business, no thanks to "Fantasia." 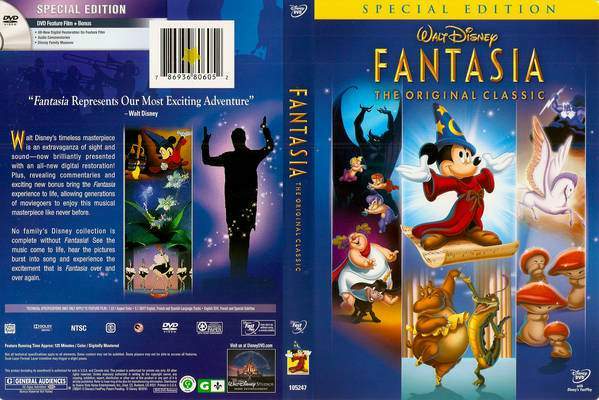 "Fantasia" since has been re-released half a dozen times, and has gone in and out of favor. 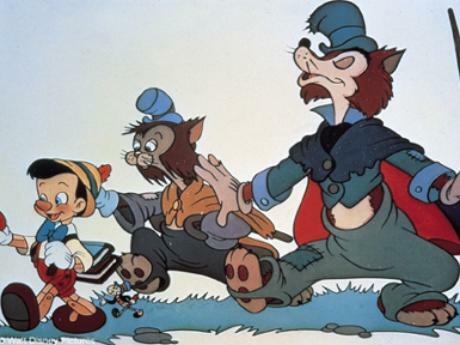 The 1969 re-release was successful because many viewers thought it fit in well with the "acid culture" of the time, just like "Alice in Wonderland," and Disney promoted "Fantasia" that way to turn a profit. "Fantasia'''s image suffered as a result. Walt surely never would have approved, but he had gone on to his own personal Fantasia. As the decades passed, nobody quite knew what to do with "Fantasia" creatively, although it made money in whatever form it took. 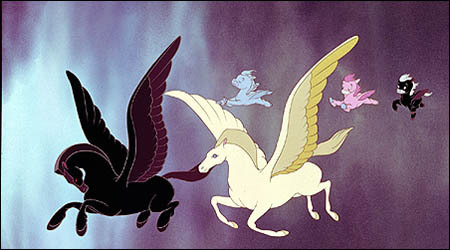 Every time "Fantasia" was shown, something different had been altered or tweaked or digitally removed. 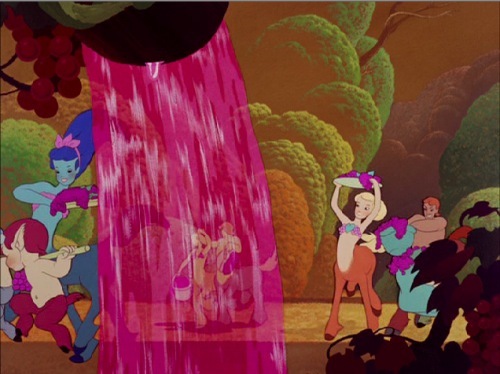 A gathering in honor of Bacchus, god of wine, for "The Pastoral Symphony"
Today, "Fantasia" is acclaimed as a classic and, in real dollar terms, is one of the highest grossing films in history. Its 1991 home video release broke sales records, and finally a sequel was initiated by Roy Disney, "Fantasia 2000," as a sort of memorial to Walt Disney himself. Of course, for those in the know, the original "Fantasia" was itself a memorial to the man - the Sorceror was deliberately ("secretly") modelled on Walt Disney, bushy eyebrows and all. 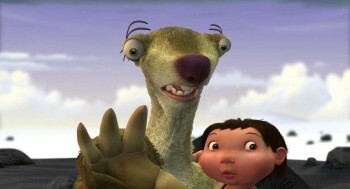 If the physical resemblance wasn't clear enough, the Sorceror was called "Yen Sid." You didn't have to be a candidate for working on the upcoming Enigma project during World War II to realize that was "Walt Disney" spelled backwards. 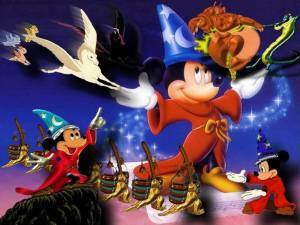 History repeated: "Fantasia 2000," released in late 1999, was a creative success, and a financial disaster. Apparently, the project took a decade to complete as the studio (meaning Roy Disney) couldn't pin down the numbers to be included until virtually the last minute (after ten full years!). You know Disney, though, they'll be making a ton of money on "Fantasia 2000" in 2030, 2040, 2050.... The "Fantasia" franchise already has had a lasting influence: outside of classical music circles, Stokowski and Deems are remembered today only for their participation in "Fantasia." 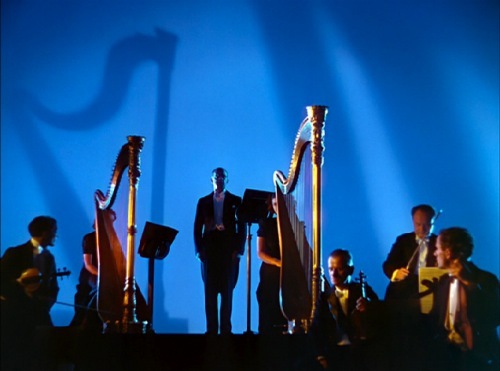 It isn't difficult to see that Walt Disney wanted to make "Fantasia" the first full-scale sequence of music videos, with the greatest production values and based on the best sources available on classical music. He was forty years ahead of MTV and its true spiritual father. He made some pseudo-sequels a few years later that were never recognized as such, "Make Mine Music," "Melody Time" and "Fun and Fancy Free," but this is the best of them all. If you enjoy fine animation, a nice selection classical music "greatest hits," and are willing to immerse yourself for a couple of hours in animation history, "Fantasia" is a top choice for an evening's entertainment. An original poster for "Pinocchio." Following the smash hit that was "Snow White and the Seven Dwarfs," Walt Disney turned his attention to another classic fairy tale, "Pinocchio" (1940). 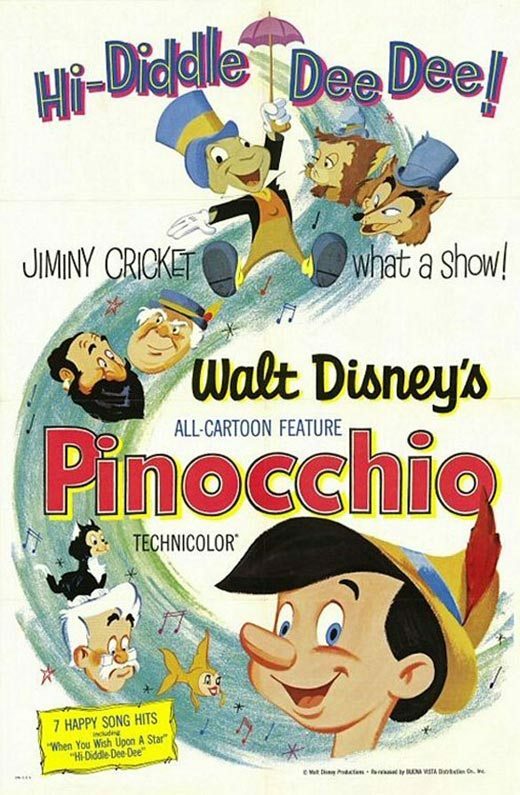 It was adapted from Carlo Collodi's "The Adventures of Pinocchio," and released by RKO on February 7, 1940. Pinocchio is famous for his nose. As usual in those days, everything at Disney was done by committee, so there are seven directors credited (Norman Ferguson, T. Hee, Wilfred Jackson, Jack Kinney, Hamilton Luske, Bill Roberts and Ben Sharpsteen) and seven screenplay adapters: Ted Sears; Otto Englander; Webb Smith; William Cottrell; Joseph Sabo; Erdman Penner; and Aurelius Battaglia. Clearly, after "Snow White," Walt thought that seven was his lucky number. The kindly old Gepetto hard at work. The film opens with the Academy Award-winning song "When You Wish Upon a Star," sung by Jiminy Cricket (Cliff Edwards). We meet the woodworker, Gepetto (Christian Rub), who lives with his cat Figaro and fish, Cleo. 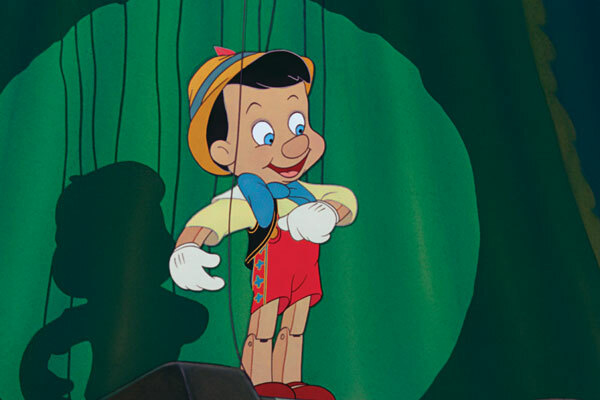 Gepetto is working on a marionette which he names Pinocchio (Dickie Jones). 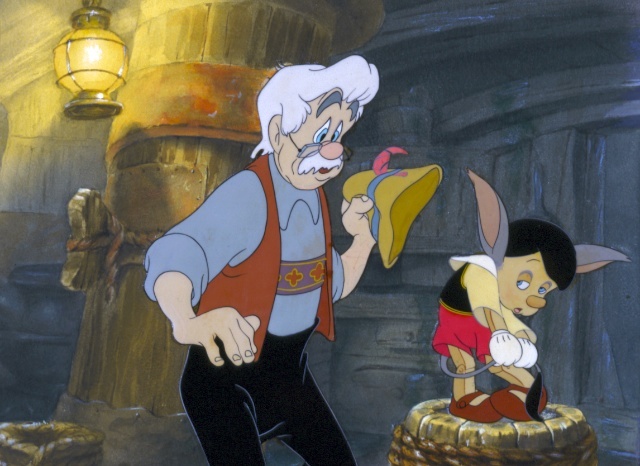 Wishing "upon his star," Gepetto wants Pinocchio to become a real boy. Somebody else is pulling the strings - at least at first. The wish comes true during the night courtesy of the Blue Fairy (Evelyn Venable). 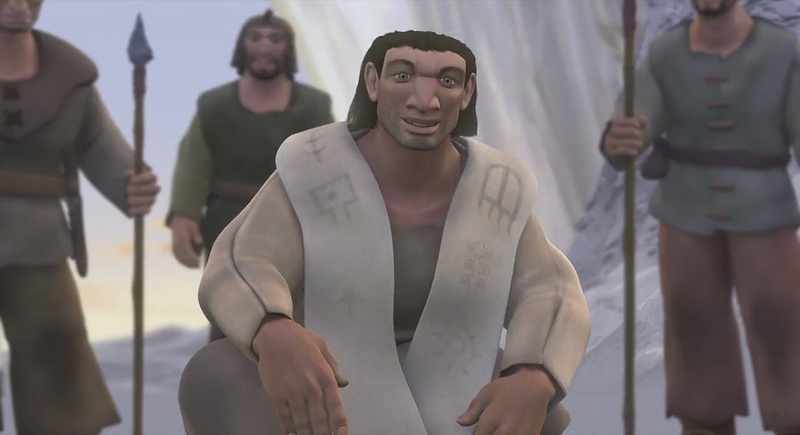 The guileless wooden boy goes off to school, where he falls in with Honest John and Gideon, who take advantage of him and send him to star in Stromboli's (Charles Judels) puppet show. Stromboli, realizing how much money Pinocchio would be worth to him, locks him in a birdcage. 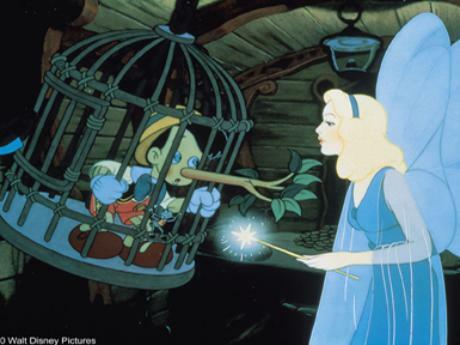 The Blue Fairy returns to ask why he disobeyed Gepetto, and Pinocchio lies, causing his nose to grow. As the Blue Fairy says, "a lie will keep growing and growing until it's as plain as the nose on your face." She then takes pity on him and sets him free. Honest John and Gideon then meet Pinocchio and convince him that he is sick and that the only cure for him is to go to Pleasure Island (they will receive rewards from the evil Coachman (Judels) for doing so). 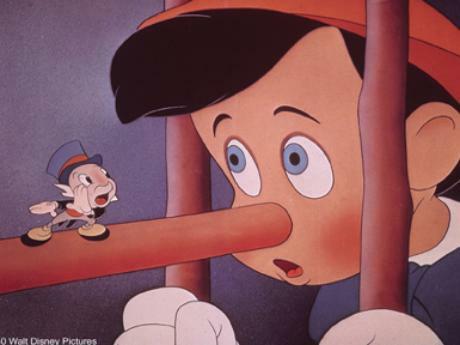 Pinocchio's nose grows when he tells a lie. Pinocchio finds that the boys on the island smoke, gamble, get drunk and generally act like delinquents. Jiminy Cricket learns that boys on the island turn into donkeys who are then sold to work in the Coachman's businesses. Pinocchio escapes but is cursed with a donkey's ears and tail. Doesn't Pinocchio look so innocent? 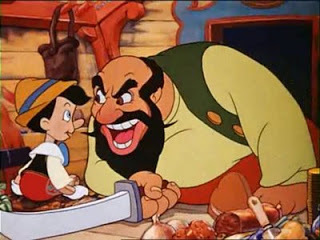 They return to Gepetto's workshop, where they learn that he has been swallowed by the whale "Monstro" (Thurl Ravenscroft) while looking for Pinocchio. They go searching for and themselves get swallowed by the whale, and they must all find a way out. This obviously is a much darker tale than "Snow White," and even frightening in some ways. Many parents did not want their children to see it for that reason. The box office was below expectations. Honest John practicing his reading. It took years to recoup the film's cost, especially in light of the closure of many foreign markets due to World War II. 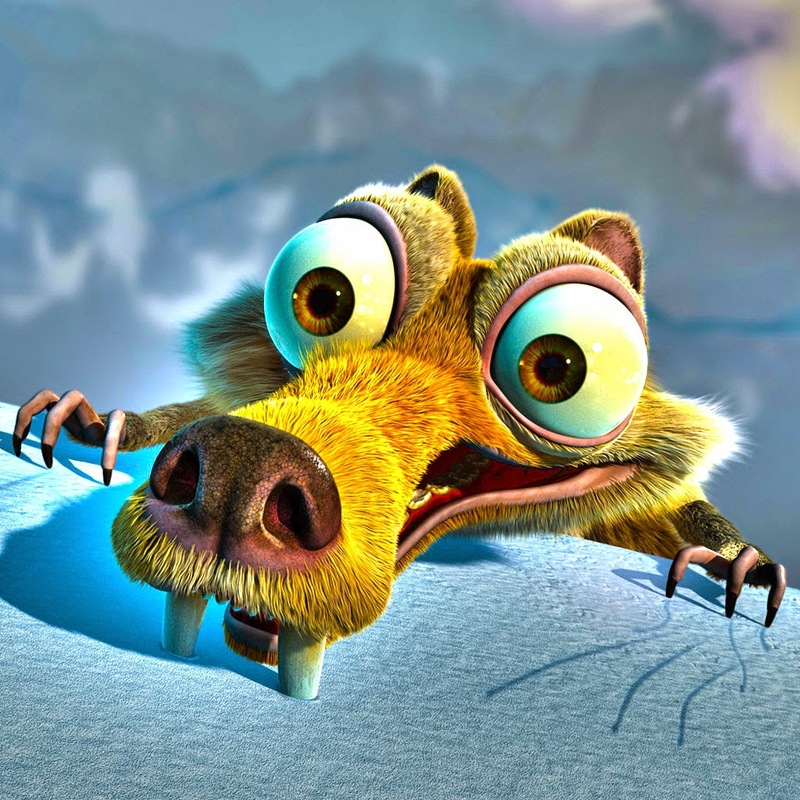 Reviews, however, were positive due to the wonderful effects animation of background items, and, over time and after multiple re-releases, the film became a financial bonanza. A common theme in early Disney is innocents taken in by swindlers. 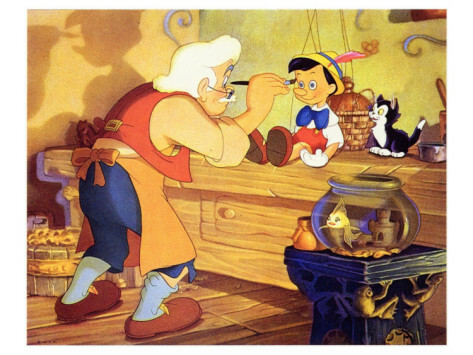 Today, "Pinocchio" is considered by many to be the top animated feature film ever made, though others consider "Pinocchio" to sit in second place behind "Snow White and the Seven Dwarfs." 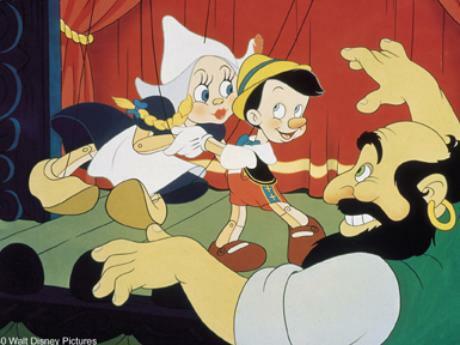 It is difficult to find anyone who dislikes "Pinocchio," though it tends to have a lower profile than many other classic Disney animated feature films. Rides and characters based on this film are centerpieces at Disney's theme parks around the world. Pretty much everyone, of course, knows what it means for your nose to grow because you told a lie, and they know that comes from "Pinocchio." So, whether or not the film itself is watched a lot these days, it has entered the lexicon. Pinocchio's nose comes in handy at times. There even was a Disney on Ice show that ran for many years in the '80s and early '90s and which led to similar efforts for films like "Beauty and the Beast. The film is voiced by top stars of the day, and even Mel Blanc manages to get in a hiccup or three. We should all have a second chance in life. The songs, a true highlight of the film, were composed by Leigh Harline, with lyrics by Ned Washington. Harline and Paul J. Smith composed the background music. Besides the classic "Star," other tunes that will stick in your head include "Give a Little Whistle" and I've Got No Strings." Hide your head in shame! Adults will enjoy this film as much as anyone. Where else are you going to see annoying kids literally transformed into jackasses? The songs should bring back childhood memories, while the story is engaging and unpredictable. Jiminy Cricket is always a favorite. After "Snow White," this is the film most people associate with Disney's early years. It is well worth viewing today by even the smallest children for the awesome songs, visuals, and story. 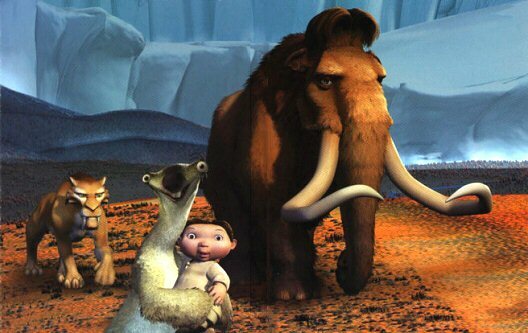 Some people think this is the greatest animated feature ever come out of Disney, and they make a strong case. 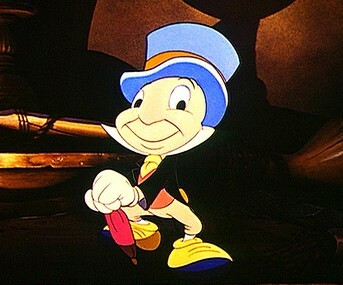 Jiminy Cricket is one of the enduring characters of "Pinocchio." Below is the original 1940 trailer.